Toast split bread under broiler. Remove bread when it is toasted golden brown in color. Brush bread liberally with garlic oil. 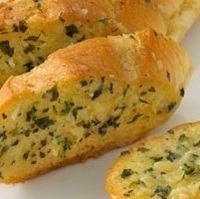 Sprinkle with cheese, if using, and parsley. If you added cheese, return to broiler and brown 30 seconds.